Gelukkie is very proud to receive a Top Valued Establishment Award from AccommoDirect.com for 2017!! “We are pleased to present you with a 2017 Top Valued Establishment Award! 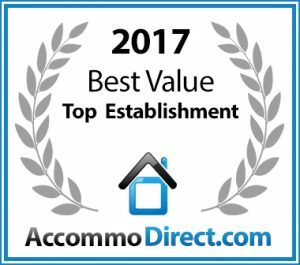 You’ve been rated as one of the best value accommodation destinations in ! Thank you to all our loving guests and to AccommoDirect.com for the lovely honour!